or activities in the weekends and holidays - throughout the year. even popular artists give concerts here. Christmas and the New Year here. some of the most beautiful and challenging golf courses in the area. Skjoldenæsholm, Trelleborg, Sorø, Harekær, Skovbo og Rønnede. 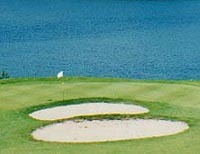 One greenfee of your choice is included in all our golf packages. It is possible to order an extra greenfee at discounted prices. accommodation, large breakfast buffet and one greenfee of choice. DKK, 1045:- per night per person in double room. Single room surcharge DKK 260:- per night.